Navajo Nation Presidential candidates Joe Shirley Jr, top photo, and Chris Deschene make their way into the Window Rock Sports Center as their supporters cheer them on. 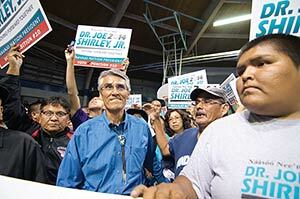 "Eight more years!” was the chant to which a loud and triumphant cadre of Joe Shirley Jr. supporters stormed the Window Rock Sports Center Tuesday night, declaring victory in the Navajo Nation presidential primary election with just a handful of chapters left to report. They were defying those who had grumbled that Shirley’s previous two terms, 2004-2011, should have been enough and Shirley should step aside and let a younger person take the helm. And if enough of the 15 ousted candidates’ supporters line up behind the man who will face Shirley in the general election, he may have to do just that. Christopher Clark Deschene, the 43-year-old attorney and engineer who nabbed a good share of the youth vote, was hot on the veteran politician’s tail with 9,734 votes to Shirley’s 10,910 — a difference of just two percent of the total.